If he could no longer screw, drink, or write--it was time to leave. So he did, with a flick of his big toe on the trigger of a twelve-gauge shotgun out in the Idaho boonies, a fitting place to say good-bye to all he loved in life. The way I saw it, World War I had ended just two years before, and it was time for young Ernest Hemingway to find a clean, well-lighted place where he could store up his gray cells during the cold Paris winter. This intrepid writer had yet to see a bullfight, land a marlin, or shoot a water buffalo. He had no inkling of his potential to become a renowed American suthor. The depths of "Papa" Hemingway's depression had not yet unhinged his mind. If an old steamer trunk's contents were legit, maybe there was motive for murder, but a body hadn't shown up yet. My client was David Trask of Manhattan real estate fame, so I wasn't about to cut off my gravy train just because the guy rubbed me the wrong way. Trask told me that he would stake his life on the authenticity of the manuscripts found in the old trunk. The game began as I waited to see if--when a body showed up--it would be his or mine. What a ROMP!!! Finished Hemingway's Trunk in one day. Finished an all-night read on Hemingway's Trunk…to say I enjoyed it would be an understatement. I'm so tired since I honestly did stay up to read it in one shot. It’s really so good. 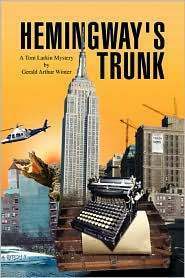 I'm not really into mysteries, but Hemingway's Trunk is definitely one of the best books I've read. It's nice to see a well-written first person narrative with great wit. I enjoyed the book so much that I found myself craving for more and not being able to put the book down. How does Winter dream this stuff up? I give Hemingway's Trunk “Six Flags”...truly a Great Adventure. Letters in Blood was the coolest, and set the tone for Larkin in Hemingway's Trunk... my kinda guy. I thought sure I figured out the twist in Letters in Blood, but when the killer's identity was revealed, I was left stunned, and had to read it all over again. Great foreshadowing, but so subtle. You really got me. In Hemingway's Trunk, the Larkin narrative is superb. The pace is so fast, I feel like I'm watching a movie rather than reading a book. No chance to catch my breath. Where do you come up with this stuff? The research and historical background lends such credibility, and the plot and twists are amazing--great read! I loved Letters in Blood as a thriller, but Hemingway's Trunk is a pure mystery, a modern day film noir, but in living color like Chinatown, and in the classic Raymond Chandler genre, more literature than merely pulp. Tom Larkin is so real, full of flaws, but he's the one you want in your foxhole if you're a guy, and if you're a woman, same-same. Loved the way he cut the super-model down to size, so cool. Tom Larkin's reappearance in Hemingway's Trunk, said it so clearly by the PI himself: "The oxymoron of my life is 'off-duty cop.' No such animal in my zoo." Wonderful characters, and a plot to die for. Hemingway's Trunk is a top-notch sequel to Letters In Blood. Colorful, bigger-than-life characters. I loved it! Plenty of action. And attitude. Larkin, with his battling mind vs. his physical response is flawless. Tom Larkin at his best yet! Absolutely brilliant. Enjoyed it sooooooo much. Can't wait for the next one. The latest Tom Larkin mystery by seasoned author, Gerald Arthur Winter. Beautiful Sophia Trask, wife of New York real estate magnate David Trask (clearly based on the infamous, real-life billionaire with the same initials), hires DEA agent turned private investigator, Tom Larkin, to authenticate an antique trunk and its contents. Allegedly once owned by Ernest Hemingway, the trunk contains early manuscripts presumably written by the Lost Generation author. Meeting the egotistical billionaire at the party for his latest Manhattan skyscraper, Larkin encounters Dr. McCullough, retired head of the archives division at the Smithsonian, who is also there to consult with Trask concerning the Hemingway find. McCullough refuses to divulge his appraisal of the manuscripts, and when Larkin sees him next, he is splattered on a Manhattan street. So begins the violence and double-crossing that characterize Larkin’s latest case. Aided by his luscious administrative assistant Mona, Larkin travels from the Jersey shore to the Hudson River Valley, his progress on the case is hampered by violent thugs determined to stop him. The criminal record of Bessie, the dealer who offered the trunk to Trask, makes her an obvious suspect, but Larkin’s questioning of the fiery redhead leads to far deeper involvement. The body count and confusion mount as Larkin questions three generations of the Baskins family, all involved in the literary field. Despite his weaknesses for redheads and drink, Larkin is an unstoppable and indestructible character... a fast-moving, worthwhile mystery.